I'm a big chili fan, especially during the cold fall and winter months. 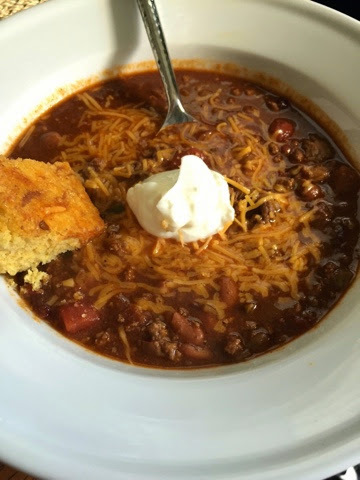 I love all kinds of different versions of chili -- vegetarian bean-filled kinds, white chicken chili with green chilies, or versions with nontraditional meats like chorizo. However, there is something to be said for that good old all-American ground beef and bean chili, am I right? Ya know, the kind that you eat while watching a football game, topped with shredded cheese and sour cream, and served with cornbread and a cold beer? Yep, that's the one. So that's what this chili is, but I promise it's anything but boring. I would even like to go ahead and call this THE BEST in the category of traditional beef and bean chili (at least... of the many I've tried!). It's based off of a classic Bon Appetit version, but I (obviously) chose to shake things up a bit. Specifically, I amped up the flavors with chipotle peppers in adobo, a bit of cocoa powder, two types of beans, and extra jalapenos. Mmmhm. Then obviously topped it with hand-grated cheddar cheese and a scoop of sour cream. Perfecto! I wasn't planning on blogging this recipe (hence the single, sad picture) since it's such a "standard" dish, but it was just too good. It's one to keep coming back to! Disclaimer: This chili is pretty spicy. My husband and I both agreed that it is actually THE PERFECT amount of spiciness (and we take spiciness ratings pretty seriously). However, if you're sensitive... be careful. Take the seeds out of the jalapenos or chill with the chipotle peppers in adobo. Or don't, and sweat your way through it like me! That's the best way. -Heat oil in a very large pot over medium-high heat. Add onions and cook until soft, about 5-6 minutes. Add the jalapenos, garlic, and chipotle peppers and saute for 1 minute. -Add the beef. Cook, breaking up and stirring meat regularly. Once completely browned, add the spices and cocoa powder. Mix to combine. -Add the adobo sauce, tomatoes, (including juice), beans, and broth. Stir to combine. Bring to a boil. -Reduce heat and let chili simmer for 60-90 minutes, stirring occasionally.